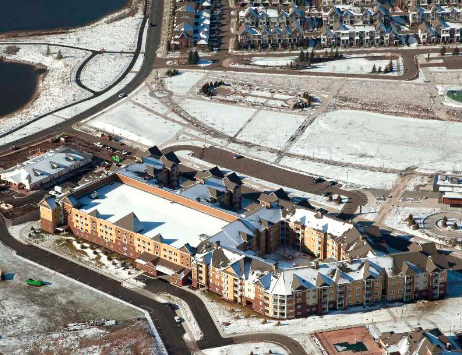 Skye at Arbor Lakes extends over 165, 000 square feet, includes over 260 units and is set in Maple Grove, Minnesota. This new apartment community will have over 15 different floor plans and offer creative and attractive designed 1 & 2 bedroom units. Standard features include: gourmet island kitchens, whirlpool appliances, granite countertops, faux wood blinds & flooring, generous pantries & closets, private balconies & patios and in home washer and dryers. Residents of Skye at Arbor Lake Apartments will have full access to the endless amenities including: BBQ summer kitchen, juice bar, lounge, game room, pub, spinning/yoga room, elegant pool with indoor spa and sauna. Life is better up here….